Two books from March 5, 2014. 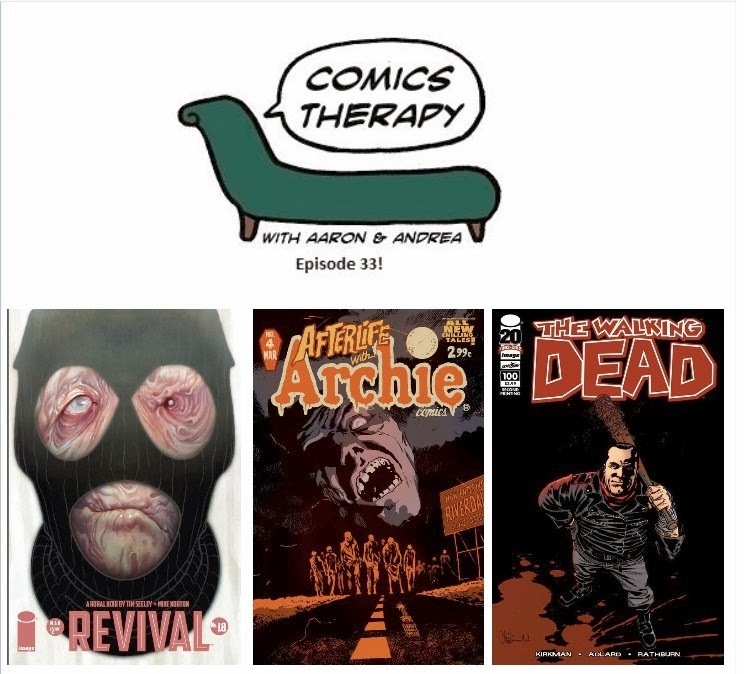 Plus your Nerd Confessions (suggested by Roderick Ruth about the scariest thing that happened TO your comics or that you've read IN a comic) and another installment of Grief Counseling, featuring The Walking Dead. This week's theme is pretty obvious, right? Zombies. Dead men - and women and children and even dogs - walking. Now before you go blaming Meyers, it was Andrea's idea. Consider this episode her submission for consideration: she's over her fear of this particular irrational anxiety and is ready to tackle the next one. In the meantime, bring on the brains. A (so far) traditional zombie tale set in the Archie Comics universe. That Sabrina the Teenage Witch is such a troublemaker. A 'rural noir' that features the dead rising, but not necessarily eating the living. Yet? Last summer, Andrea started reading The Walking Dead for the show. Through the ups and downs since then - and the many many times she threatened to quit - most people didn't think she'd make it this far. Well, we are truly blessed, for she has finished the hundredth issue and now we’re going to hear about it. It's okay to admit that, like Aaron, you're hoping there will be more crying. Episode 36 - Road Trip!